On Wednesday (15th August) a number of local agencies came together to hold a successful Community Safety Day in West Denton. Teams from the Fire and Rescue Service, Your Homes Newcastle, Northumbria Police and Safe Newcastle were out speaking to residents in West Denton about community safety and anti-social behaviour, with the Fire Service also undertaking home safety checks. The Fire Service’s Outreach vehicle was located in Morrison’s car park with partners offering advice on all aspects of community safety. 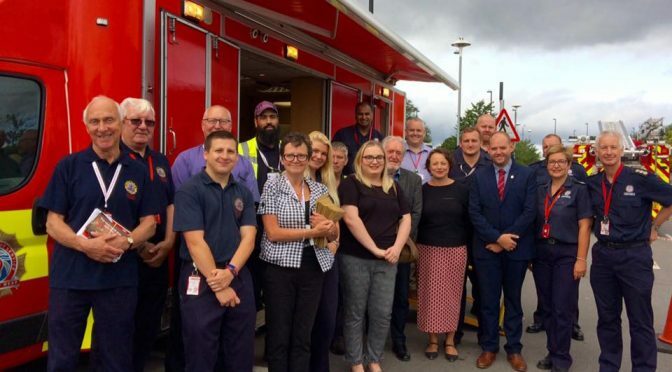 Denton and Westerhope Councillors Brian Hunter, Dan Greenhough and Melissa Davis joined partners at the Fire Outreach vehicle, alongside Newcastle North MP, Catherine McKinnell. ‘The Community Safety event at West Denton was a huge success. We carried out more than 100 Home Safety Checks and made over 20 further referrals including a number for special sensory alarms. We were also fortunate to have the Fire and Police Cadets supporting the event, who all took part in a really effective litter pick. ‘The event provided us with the opportunity to speak to local businesses in the area with Newcastle City Council’s Safe Newcastle Team, where we had constructive discussions about day to day issues faced in the West Denton area. ‘The Community Safety event was really important in showing our joined up approach to addressing issues, and it was great to see so many residents engaging with agencies.